This story emerged far too late for today’s Macalope and, while the beast may still cover it, I feel compelled to respond. Update: Turns out that this was first published on October 23, but I suspect even the Macalope has standards for what inanity the beastly one will touch. There’s so much wrong with this chart alone. There’s the nonsensical footnote, “2002 Jaguar was first version for Mac”, and the fact that they completely miss the free upgrade between 10.0 and 10.1. 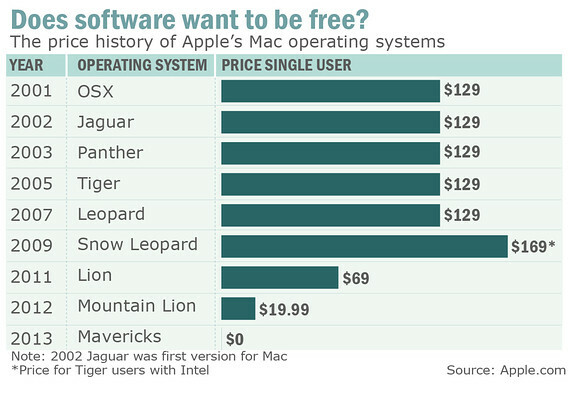 Then there’s the ridiculous Snow Leopard price, which they explain as if the user upgraded from Tiger, without mentioning that it was $29 if you upgraded from Leopard, not to mention the completely incorrect $69 price for Lion (it was $29 for a single user license). That’s just in one chart. “Today, we’re going to revolutionize pricing,” said Craig Federighi, who heads up Apple’s operating systems said of the new OS. Mavericks, as the software has been dubbed, will be faster and use up only the amount of battery the task requires, but—critically—it will keep computer users within Apple’s ecosystem. As opposed to if Mavericks cost $19, and if users didn’t upgrade, they’d be permanently ejected from the Apple ecosystem like someone with a highly-contagious disease. Though users can cheer the free operating system now, the move also gives Apple more leeway to charge premium prices for its upcoming gadgets. The iPad Air, launched Tuesday, costs between $499 and $929, depending on the model. Which happens to be exactly the same price range as the fourth-generation iPad which the iPad Air superseded. Fottrell also neglects to mention the iPad Mini’s price reduction of $30, making it the least expensive price for a new iPad ever. Nice little bit of hack writing to start the weekend, though.